Hello again and welcome to the second edition of Lesley’s blog, “Annabel Lee”. The Tarot card which I have chosen for today is the Two of Batons, a card of movement, of course, being a baton. It refers to a project which has commenced, but which requires further work. Shuffling and concentration brought forth the Queen of Swords. Fittingly, Her Majesty points to the uncovering of a new path and finding satisfaction in what you do, while an idea develops. So, today is a day of consolidating your work to date and waiting for the next step to be revealed to you. But do beware! The Queen can also warn of an unexpected and not entirely pleasant event or visit. Do tell me how you go this Tuesday.. The lovely floral tapestry which you can see behind the cards (The Original Rider Waite Tarot Pack BTW) is from a set of chair covers which I bought in a garage sale in my street. 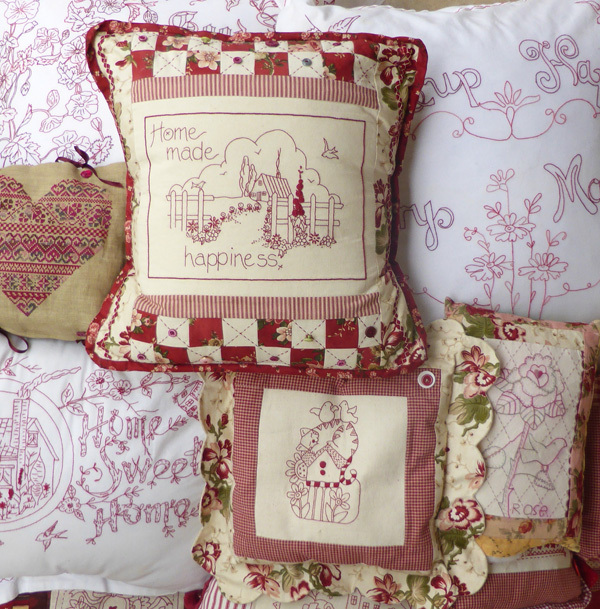 Each stitchery is different and I intend to make them into a bag – details to follow. The colour of Tuesday is red. I went through a Red Stage during which I could only stitch in red. In particular, variegated red. I had a thing for cushions. There are more. They live in the bedroom. My husband hates them. I didn’t go through the same red phase in painting. But red does feature in this painting of the Archangel Michael. As you can see, it is unfinished, a work in progress – yet another UFO. I have cheated with the face and hair. I have drawn the basics in PEN. It was the idea of redoing it all properly with a brush that caused me to throw myself backwards in horror, pour another champagne and put the painting away until….whenever. “Red roses blow but thrice a year, in June, July and May. But those who have red noses can blow them every day”. He also pretended to have scarlet fever, to keep train carriages to himself. Peter’s Thumbnail Review of Mark Amory’s “Lord Berners” is here. It’s one of my favourite biographies.